Keeping track of contemporary market development we are actively engaged in offering premium quality Bathroom Shower Enclosure. 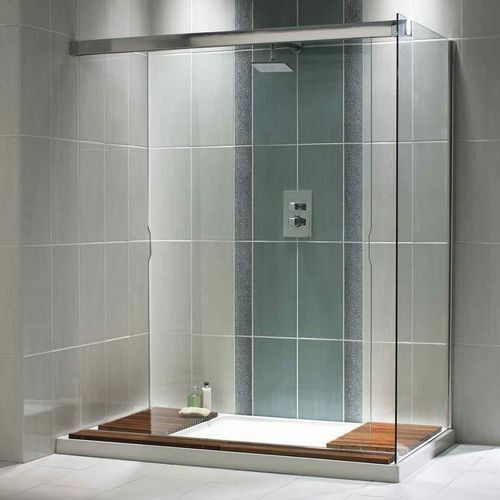 This enclosure is customized to your bathroom space to separate wet and dry areas. Made with only the highest quality toughened glass and treated with the patented Clean Coat technology, it is designed to retain its superior aesthetic appeal for a long time. Clients can avail this door from us in various specifications as per their requirements. KOHLER® SHOWER ENCLOSURES Elevate your showering experience with Kohler shower enclosures, customized to your bathroom space to separate wet and dry areas. Made with only the highest quality toughened glass and treated with the patented Clean Coat ™ technology, Kohler Shower enclosures are designed to retain their superior aesthetic appeal for a long time. Kohler’s shower enclosures are installed by the expert Kohler Shower enclosure team to ensure a hassle free installation experience for you. We "The Bath Studio” from 2007 are a broadly recognized organization involved in trading, retailing and wholesaling a large assortment of Sanitary Products. In our highly acclaimed assortment of products, we are offering best quality UPVC Windows, Bathroom Fittings, and UPVC Doors. Our provided products are manufactured using quality tested components at our vendor’s ultra-modern processing unit. These products are highly used in various fields for their fine finishing, lightweight, high strength, easy usability and longer life. We are backed by a team of professionals for running our business in a reliable manner. Owing to which we are famous in this domain. Due to the relentless work of our team members and our vendors, we have gained the trust of various patrons across the market. Besides, we have an R & D Team to conduct research work to upgrade the tools available with us. For this high-quality range of products, we are able to build the strong relationship with patrons in the short span of time. We offer our products in the market under the Fenesta, Kohler, Cata, Stiebel Eltron and Hunter Douglas brand name.